Description: This Alternating Triangle Sennit is unique in the fact that the Triangle Knots are made in opposite directions, resulting in a zigzag pattern. 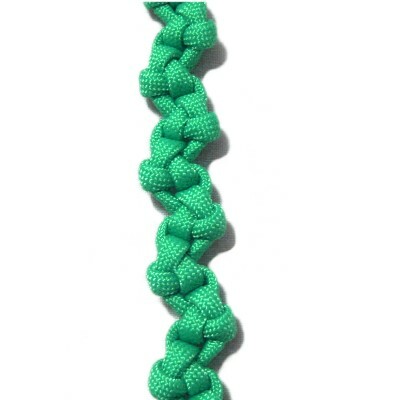 The end result is a slender chain of knots suitable for bracelets, belts, necklaces, and similar projects. 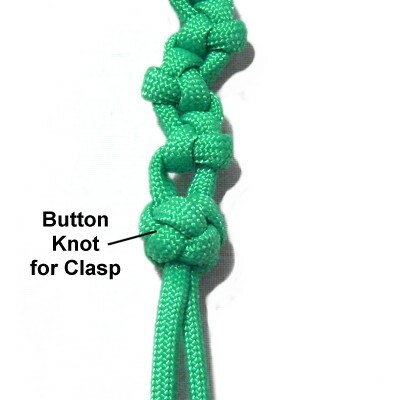 These instructions include a loop you can use for a clasp. 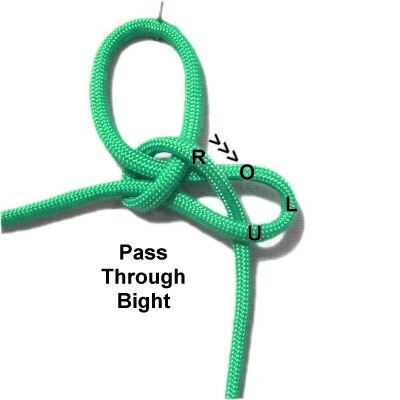 A button knot can be tied at the opposite end. Please read the bottom section of Cord Preparation if you plan to use Parachute Cord, which is the material you see in the example. Preparation: You need one cord to practice, at least 45 inches long. To use the Alternating Triangle Sennit for a project, multiply the finished length you plan to make by 8, and cut the cord to that size. Step 1: Fold the cord and mentally label each half. Make a loop at the center, crossing right over left. Secure it on your board as shown, with the right half vertical and the left half horizontal, heading right. 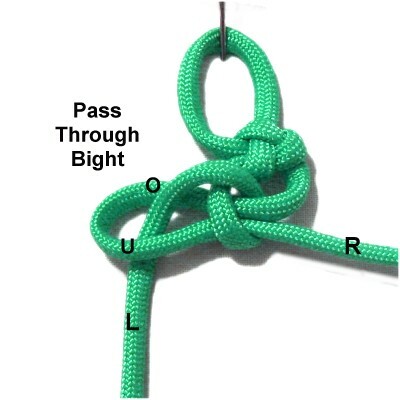 Move the left half of the cord to the left, folding it to form a bight. Pass it under the right half of the cord. 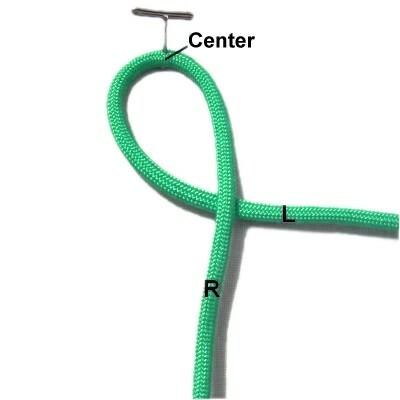 Step 2: Make a clockwise loop with the right half of the cord, passing under the bight vertically, heading backward. Pull it through the first loop. Pass over the right side of the first loop as you pull it to the right. Pass the right half of the cord through the bight front to back (over - under). Step 3: Adjust the size of the first loop so it's appropriate for the type of project you are making. Tighten the second loop firmly by pulling the right half of the cord. 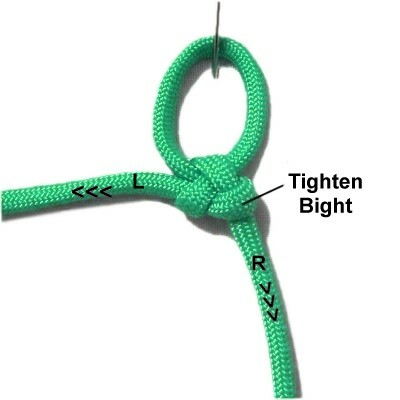 Tighten the bight by pulling the left half of the cord. 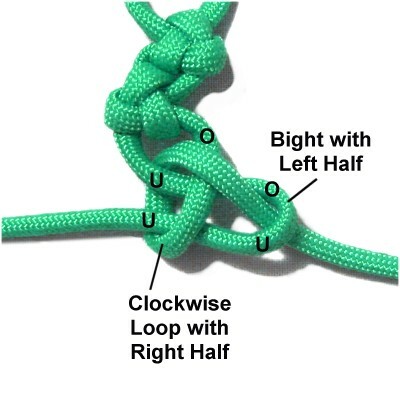 Re-tighten the second loop as needed, so the entire knot is small and firm. It's important to tighten each knot in the Alternating Triangle Sennit firmly, especially when you are using slippery material like nylon and satin. Step 4: Arrange the left half of the cord so it's vertical. 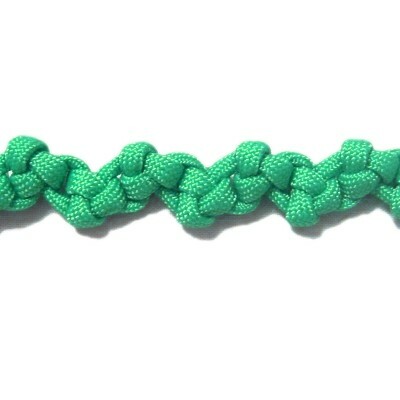 Fold the right half of the cord to form a bight, then slide it under the left half so the fold is on the left. 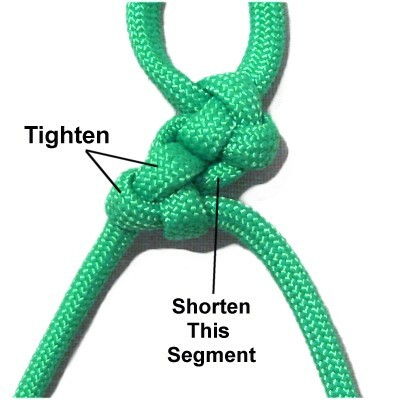 Make sure there is a space between the first and second knot. 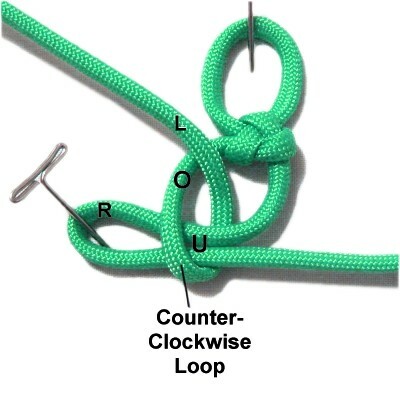 Make a counter-clockwise loop with the left half of the cord, passing under the bight as you move it backward vertically. 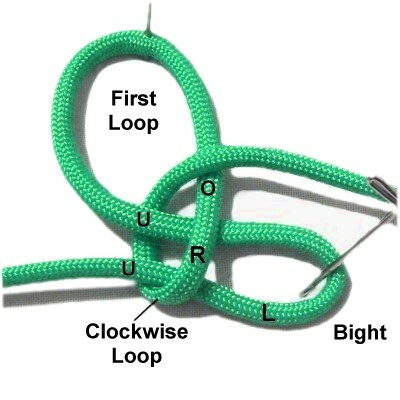 Pull it through the space, then to the left to complete the loop. Step 5: Pass the left half of the cord through the bight over - under. Tighten the loop by pulling the left half of the cord. 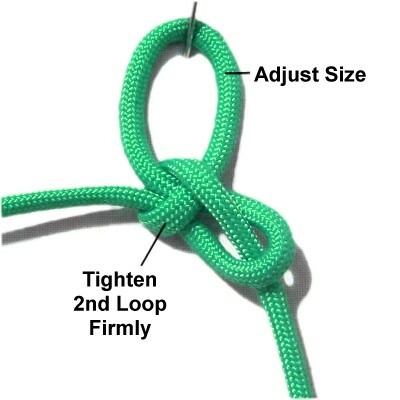 Start tightening the bight by shortening the segment coming from the first knot, so the two knots are touching. Then pull the right half of the cord to tighten the rest of the bight. Step 6: The next knot is on the right, so use the left half of the cord to make the bight. 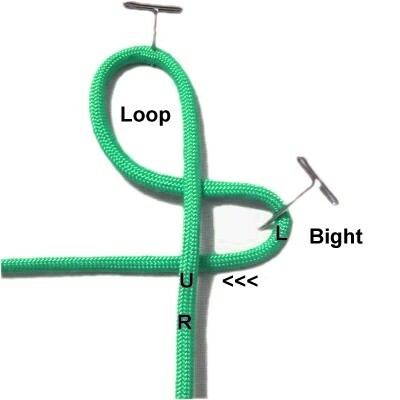 The right half is used to make the loop, which is labeled in this image. Tighten it firmly. Shorten the portion of the bight coming from the left before tightening the rest of it. Step 7: Repeat steps 4 - 6 several times if you are practicing. Stop when the Alternating Triangle Sennit is the size you need for your project if you are making something with this technique. Step 8 (optional): Tie a button knot if you need a clasp, such as for a bracelet or belt. 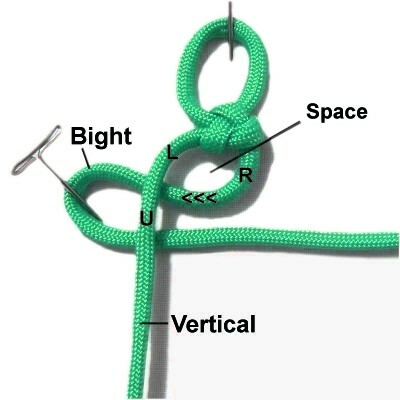 The knot shown here is the Knife Knot, also called the Diamond knot, which I recommend. Have any comments about the Alternating Triangle Sennit? Contact Me.